The right sword for your Hero or Villain can make a big difference in your production -- another important supporting actor. If you are making a period piece, the right weapons help tell the story and transport your audience to another time and place. We make very accurate and detailed historical pieces, original fantasy pieces and other creations. Rentals of existing swords are available at very reasonable rates and conditions. We can also design original pieces to meet your needs, or make your production designs a reality. Let us show how we can meet your requirements, budget and timeline, from beautifully detailed swords for close-ups, to tough and safe aluminum-bladed props for fight scenes. 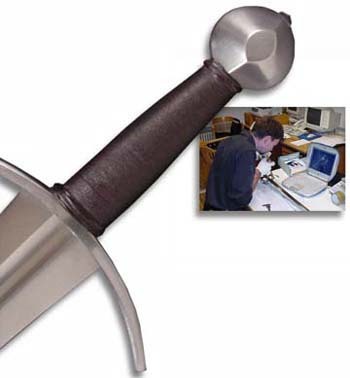 Peter has documented hundreds of original swords in museums and private collections. Let his extensive first-hand knowledge and eye for detail bring hisory to life in your production. See some of Peter's recent work here. Contact Mike at Albion Customer Service for standard rental rates and custom quotes. Get discounts and other benefits by joining the Albion Benefactor's Society.